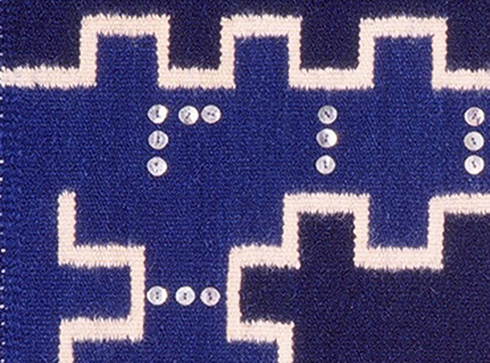 This Audrey Moore quotation is taken from an essay she wrote in 1998 describing her passion for Navajo–style weaving. The essay goes on to discuss the beginnings of her long career as a teacher of Navajo weaving techniques at the Damascus Pioneer Craft School in Damascus, Oregon, currently the Damascus Fiber Arts School now owned by Audrey and under her leadership. Audrey began her life in fiber when she inherited her grandmother’s spinning wheel. Enrolling in classes at the Damascus Pioneer Craft School, she learned how to use it. Her next step was weaving on a floor loom, but discovered very quickly that it was too mechanical for her. She wanted freedom at the loom. Working With the Wool by Noel Bennett and Tiana Bighorse, had just been published and provided the fundamental information of Navajo looms, warps and tapestry techniques. 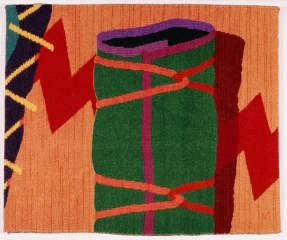 Audrey soon learned the basics and loved “making decisions row by row”, creating a tapestry, identical back and front with decorative edge cords on all four sides. This weaving style would eventually become much more expressive and creative for her. 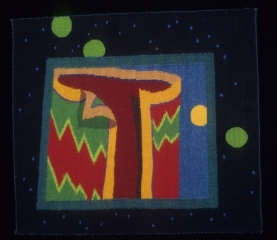 Close observation of Audrey’s early tapestries (those in the first Gallery), clearly show the influence of Navajo motifs. Geometric patterns, diamonds, stripes, smooth diagonals and lightning dominate this work. 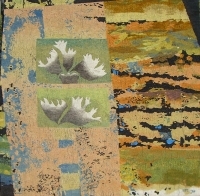 In the early textiles, Audrey’s use of hand-spun vegetal-dyed wool led to a subtle palette that is in high contrast to the bold and complementary palette which became a significant element in her development as a tapestry weaver. While the Navajo influence is strongly evident in the first Gallery , one can also see that Audrey has already begun her movement to a signature style that continues to employ Navajo techniques and motifs but also explores a more abstract style in the modern art mode. This change will become evident in the second Gallery. 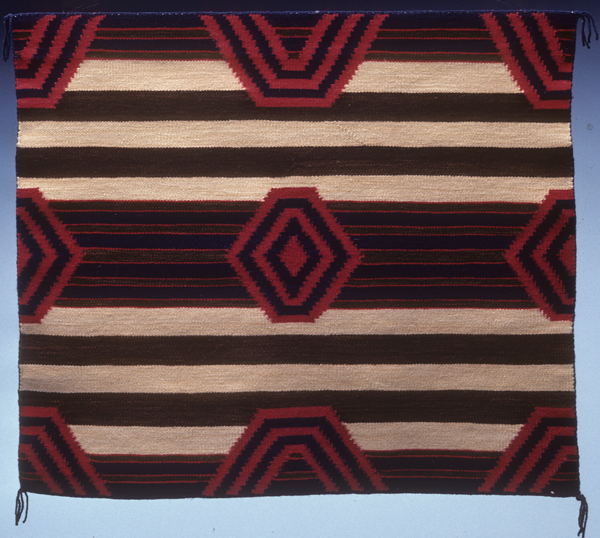 A decisive movement away from Navajo motifs to a personal, more contemporary interpretation can clearly be seen in the three tapestries of a textile within a textile. 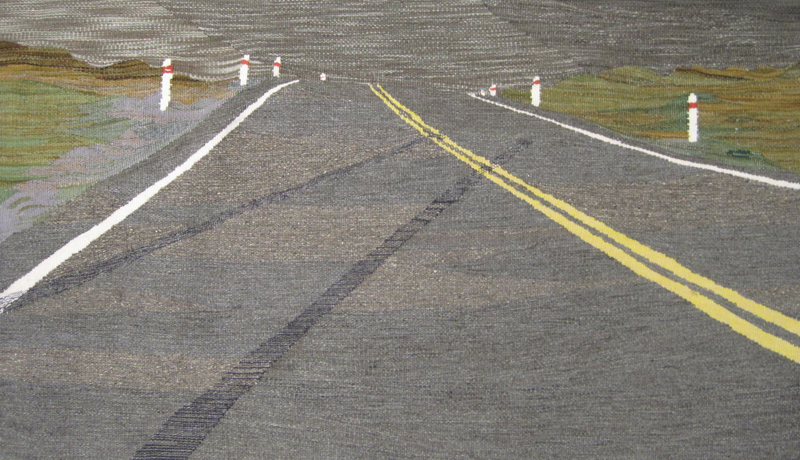 The tapestries viewed in the second Gallery are dominated by this contemporary imagery and display a growing interest in illusionary space which is created by the introduction of shadows and ribbons. At this stage in Audrey’s career, there is a distinct movement away from Navajo elements to a personal iconography which employs textiles within textiles or referential tapestries. 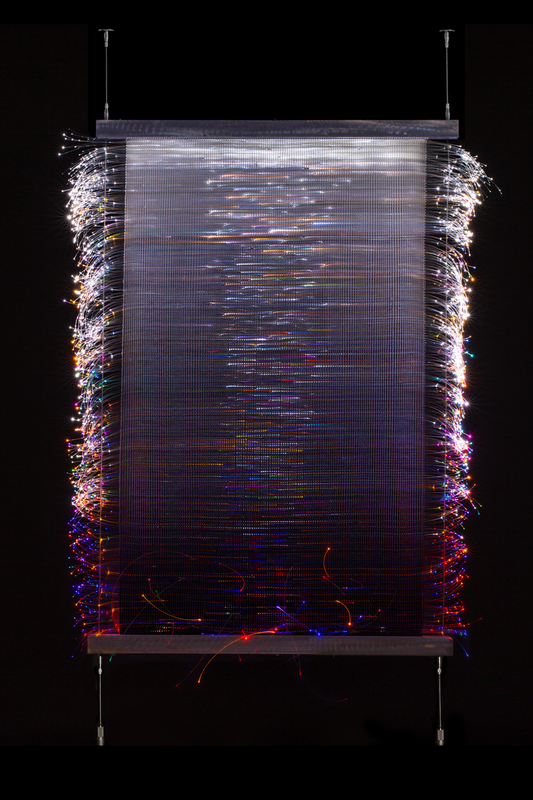 The images have become more energetic and asymmetric, with lightning images increasingly jagged. More curves are evident, taking the place of smooth diagonals and a distinctly linear composition. The movement from Navajo motifs to her individual and more personal artistic expression has now taken hold. The Third Gallery exhibits are what I find to be some of the most beautiful and thoughtful of Audrey’s images. 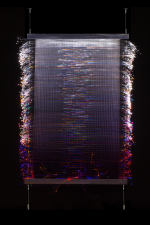 These are the abstracts with woven scrolls of woven cloth, sometimes tied with woven ribbons to keep the image tidy. For me, these tapestries are about color and the fusion of personal and contemporary imagery in cooperation with her homage to Navajo inspiration. 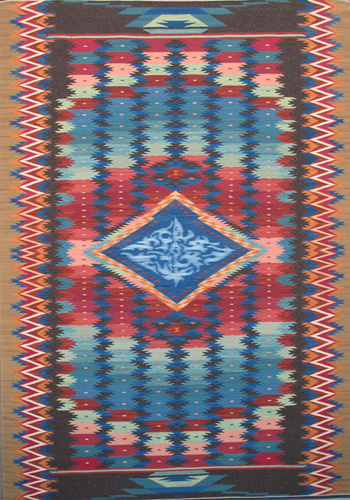 There is still the influence of the Navajo black and red palette but these diamonds, ribbons, lightning and textiles have become signature Audrey Moore tapestries with a liveliness that can still be reflective and makes you pause and look for a long time. Composition is balanced but moving, re-formed geometric shapes sharing the plane with bright colors. The referential concept of a textile within a textile led to the more literal idea of dresses as the focus of the weavings. “I’ve always liked bright, dramatic color combinations and they are the most appropriate for the impact I want to make.” That impact can be seen in the “Ladies” series that you will find in the Fourth Gallery. 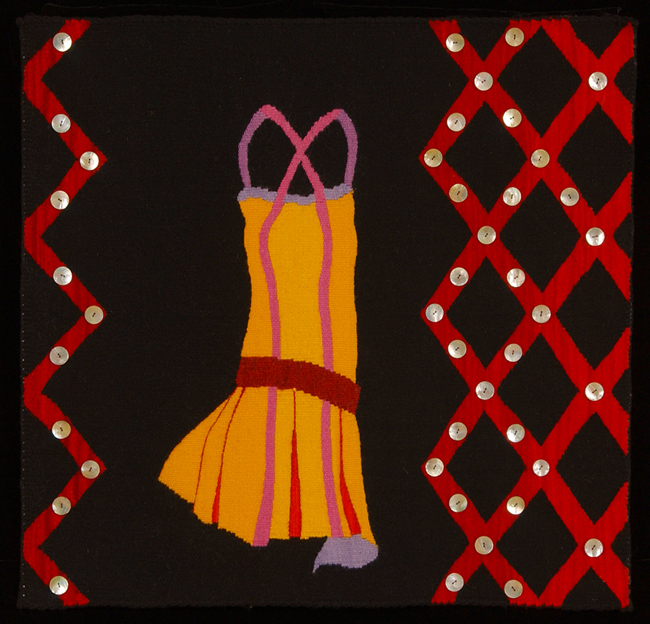 Weaving “The Ladies” was, for Audrey, a logical artistic progression from weaving textiles referentially in the tapestry, along with ribbons, signature curves and folds to weaving dresses, robes and jackets. 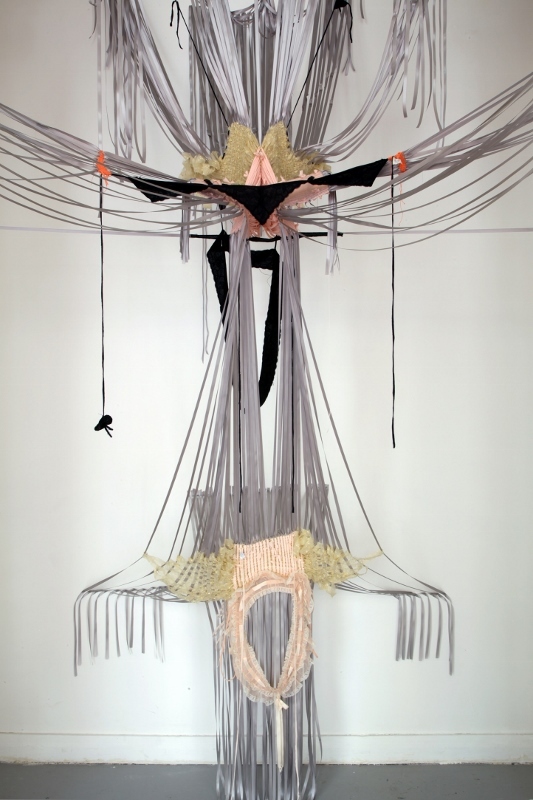 She began with the textile floating in the center, the centered image reflecting a Navajo expression, but has moved to a more narrative concept. We still see stripes, circles, crosses, zigzags, ribbons and bright bold color, but a new element has been introduced. The addition of applied buttons is added, inspired by the beautiful shimmer of the button blankets created by Northwest Coast native peoples. A reflection of the continued passion and fascination Audrey has had for the crafts and culture of Native Americans. When talking about the “Ladies” series, Audrey points out, “our clothing is our biography. Our clothes reference our culture, our history. Clothes saved remind us of our passage through time. A heritage is re-kindled through the ‘old’ clothes that we keep, share or remember.” Audrey’s “Ladies” tapestries “are really all one weaving, meant to be seen as a ‘crowd’.” The “Ladies” are often framed within a frame with circles echoing the roundness of the buttons. Some of these “Ladies” are sassy and swingy with super-animated lightning, others display fashion of the day – in all a wonderful “crowd” of color and movement. Audrey Moore has mastered the Navajo weaving techniques and made them her own. 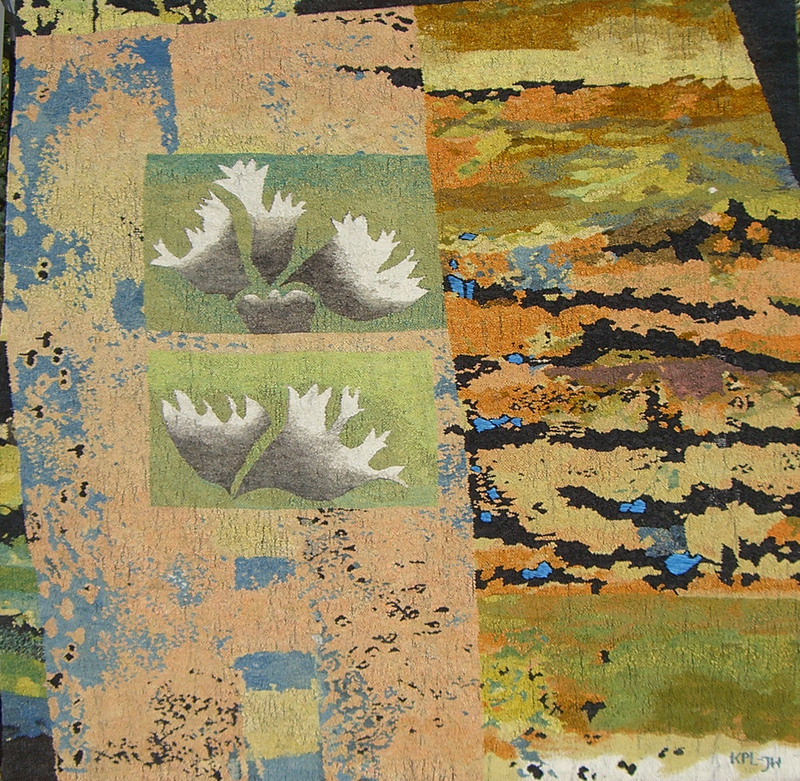 Her tapestries are a reflection of her skill at weaving a beautiful surface and her imagination for taking classic shapes and making them lively, bright, often full of fun and personality and such a pleasure to gaze on. Audrey continues her own conversation with The Ladies and the newest dress informs and addresses her continuing creative explorations. 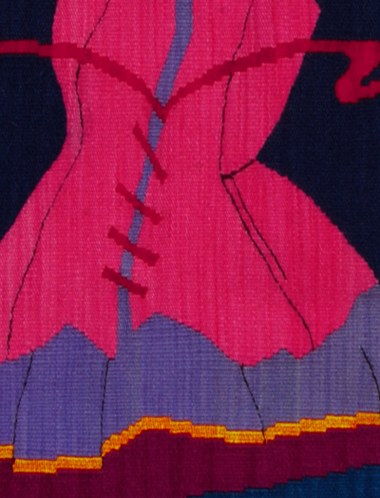 The most recent “Lady” woven by Audrey is the “Pink Dress” in Gallery 4. 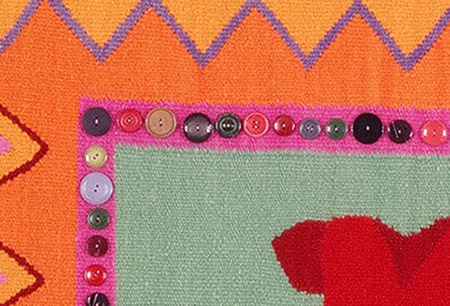 Ribbons are curling and dancing around the green frame, a ruffley skirt steps forward outside the frame and the orange circles draw the eye to the top of the textile where buttons play around the border. Narrative and lively yet abstract, a wonderful example of Audrey Moore’s current direction. 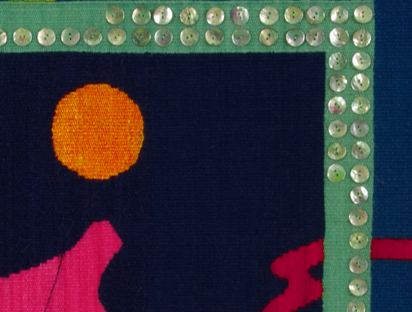 I have described and focused on only a few of the many joyful surprises that await you in this exhibit of the beautiful, fun and remarkable tapestries of Audrey Moore. Through her 30 plus years of exploring tapestry, Audrey has powerfully developed a tri-cultural style with her respect for and fascination with the Navajo, the Northwest heritage she has embraced and her modern art sensibilities. Audrey never stops weaving and currently sees her work as continuing to be more abstract. She may go back to weaving ribbons, but each new tapestry will be the result of ideas that she has built on for over 30 years and they will be beautiful.